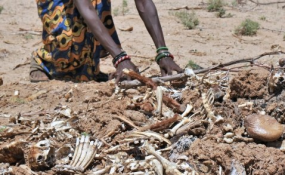 Two more people were on Tuesday reported to have died of hunger in Baringo County. Most of the reported deaths have occurred in the county, although two were reported in Turkana County last week. Speaking during relief food distribution in Nginyang', Tiaty, Baringo County, on Tuesday, Silale Ward Representative Nelson Lotela claimed to have the names of more than 17 people who have died of hunger in the area. He said the latest victim was a 60-year-old man who died on Monday evening in Loruk, on the border of Tiaty and Baringo North sub-counties. "We wonder why the government is disputing reports that people have died of hunger in Baringo ... We have all the records," he said. "I can take the provincial administration to the homesteads of all the people who have succumbed to hunger. Why are they disputing our reports yet we are right? They have even gone to the extent of intimidating us and the local chiefs for giving the reports to the media," Mr Lotela said. Meanwhile, Yatya Location Chief Jackson Keitany also said a 75-year-old man died of hunger on Sunday evening. However, Rift Valley Regional Coordinator Mongo Chimwanga on Tuesday insisted that no one had starved to death, adding that mechanisms had been put in place to contain the situation. "No single soul has been lost in Baringo or Turkana counties as reported by the media. It is only that the short rains experienced in the areas were not enough, and the long rains are late, leading to food and water shortages," he said. Devolution Cabinet Secretary Eugene Wamalwa, who distributed more than 1,000 bags of maize, said the government had released Sh2 billion to cushion Kenyans against the long, dry spell. He said most Kenyans depend on rainwater and seasonal streams, which are not reliable, noting that there is a need to encourage irrigation agriculture. About 5,000 residents in Oropoi, Turkana County, on the Kenya/Uganda border, need food. Most of them crossed over to Uganda last year but have been forced back following rising tension in the neighbouring country after a banditry attack last week. They were forced out of the country by security officers following claims that they had stolen cattle from Dodoth herders. Acting area Sub-Chief Joshua Elimlim said majority of the residents have no food at all. Meanwhile at the Coast, the Kenya Red Cross Society (KRCS) is on high alert after several water pans and pastureland began drying up in Kilifi and Tana River counties. Kilifi County KRCS coordinator Hakima Masoud said: "We are keenly monitoring the pattern of the long rains, which are expected to begin between this month and April. The situation might worsen if the rains delay to late April or May." Magarini Deputy County Commissioner Simon Lokorio said the drying up of water pans is causing panic among the residents. In Ganze, area MP Teddy Mwambire said the drought is worsening by the day and called upon the government to intervene and arrest the situation, which has also affected learning in schools. "The government and other humanitarian agencies should supply food and water to the residents and schools as a short-term strategy fighting drought," he said. Mr Mwambire also urged the government find ways of harvesting rainwater to be used for irrigation. "The Metrological Department report says there will be flash floods, and the government should harvest the rainwater and use it in irrigation to ensure food security," he added. Mr Richard Karani, Ganze deputy county commander, said most pastureland has already dried up, causing panic among livestock farmers. Tana River Senator Juma Wario has called upon county and national governments to swiftly address the situation.